When the Brewers added Wright to their rotation, they added a proven winner and much needed veteran. Wright came up with the California Angels in 1966 and spent his first few years bouncing between starting and relieving with mixed results. The Angels waived him after the 1969 season, but he regained a spot on the team after working on a screwball and changeup in winter ball. Wright’s best big league campaign proved to be 1970 as he set a franchise record for wins in a season with 22. Nolan Ryan later tied the mark, but Wright remains the winningest left-hander in a season for the Angels. He also made the All-Star team in 1970 and happened to give up the 12th inning single in that brought Pete Rose around to barrel into catcher Ray Fosse – giving the National League a victory. After putting up records of 16-17 and 18-11 in 1971 and 1972, Wright fell to 11-19 in 1973. Still, he had just a 3.68 earned run average. Also noteworthy were his innings totals from 1970-73 as he never threw less than 250 innings in a season in that period. The Brewers looked at Wright’s potential of slotting into a rotation that mainly featured Jim Slaton and Jim Colborn. The Brew Crew needed a starter that could eat a lot of innings, and based on his previous numbers, it appeared Wright was the guy for the job. On October 22, 1973, the Brewers made a huge swap with the Angels to get their man – giving up Ollie Brown, Joe Lahoud, Skip Lockwood, Ellie Rodriguez, and Gary Ryerson for Wright, Steve Barber, Ken Berry, and Art Kusnyer. Wright started off the season with three straight wins, including a complete game three-hitter over Detroit. It was his longest winning streak of the year. But as the season went on, his end results were like several other 20 game losers – a lot of innings pitched (232) and a decent ERA (4.42) with anemic run support. Wright’s ERA might be a bit misleading as he put up better numbers in the first half and was over 5.50 in his last 14 games of the year. He walked just 54 batters, but he did have to get around over a hit an inning (264 total) and surrendered 22 homers. The Brewers scored two or less runs in 13 of Wright’s games, including five shutouts. In one of those shutouts they didn’t even manage a hit! Steve Busby of Kansas City threw the first no-hitter in Brewers history on June 19, and only allowed George Scott to reach base on a walk. Wright pitched a complete game – one of 15 that season he’d go the distance – but lost 2-0. 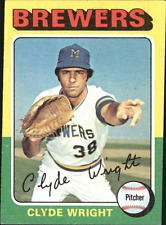 Wright did not shut out the opposition in any game in 1974. He wasn’t immune to getting lit up, but it didn’t happen too often. One example was the eight runs Wright gave up to the Chicago White Sox on May 3 in just 2.1 innings. Wright’s shortest start of the year happened in Anaheim on May 29 against his former Angels teammates, but it had nothing to do with the other team scoring a lot of runs. In the first inning Wright recorded a quick out and then gave up a single. Left fielder Bobby Valentine came to bat and Wright greeted him with a pitch over his head, retaliation for Valentine telling a reporter in the offseason that he “thought it was a good thing we traded away a pitcher named Clyde Wright” and that “we got rid of the troublemakers” in regards to the trade. Both dugouts emptied and a basebrawl ensued. Valentine suffered a dislocated shoulder in the melee and missed nearly three weeks with the injury. Wright walked off with just a small cut under his right eye and didn’t miss a start. The two instigators were ejected from the game along with Angels manager Bobby Winkles. The line for Wright was 1/3 of an inning with a hit given up, plus a run allowed after the batter came around to score off reliever Skip Lockwood. The Brewers later won 7-5, taking Wright off the hook for a decision. After a seven-game losing streak that started in July and ran into August, Wright found himself demoted to the bullpen. He appeared three times in relief before taking a loss to Boston – his 19th – on September 8. The next appearance for Wright was a five inning stint in relief of starter Jim Slaton, and he picked up a win. He moved back to the rotation and made one final start where he lost against the Tigers to end the season at 9-20. Wright’s final appearance as a Brewer came three days later, again in relief of Slaton. Wright ended up being traded after the season to Texas for righty starter Pete Broberg. Wright lasted just a season in Texas before going to Japan where he spent three years with the Yomiuri Giants. His tenure in Japan was a lot more colorful than in the major leagues. Wright had an incident in his first season where he refused to hand over a ball to his manager after being pulled from a game. Wright chucked the ball into the dugout and then went into the clubhouse where he ripped off his jersey and tossed it into a bathtub. He became known as “Crazy Wright” after that, but did end up with his manager’s backing despite their initial dispute. Later the press and fans backed off and he became a popular player due to throwing balls to children in the stands. Wright is one of many Brewers with a son that played major league baseball. Jaret Wright also was a pitcher and spent eleven years in the big leagues, starting in 1997 with the Cleveland Indians. His third career start was a 4-3 win over the Brewers and he went on to start two games in the World Series as a rookie. There have been 97 starting pitchers since 1920 that lost 20 games in a season, but just one after the 1980 season. Danny Darwin fell just short with an 8-18 record for the Brewers in 1985. The team expected great things from Darwin, but his less-than-stellar results got him traded the following season for pitchers Mark Knudsen and Don August. Other 18 game Brewers losers (say that 10 times fast!) are Jerry Augustine (1977), Jim Slaton (1975), and Lew Krausse (1970). Even lousy teams don’t allow their pitchers to reach the 20-game loss plateau these days. One such team that Brewers fans would like to forget was 106-loss team in 2002. That particular team had countless whiffs at the plate and mediocre pitching. Glendon Rusch and Ben Sheets did everything they could to make history that season, but both fell short with 16 losses. Rusch even lost his last three starts before he thankfully ran out of games to pitch. 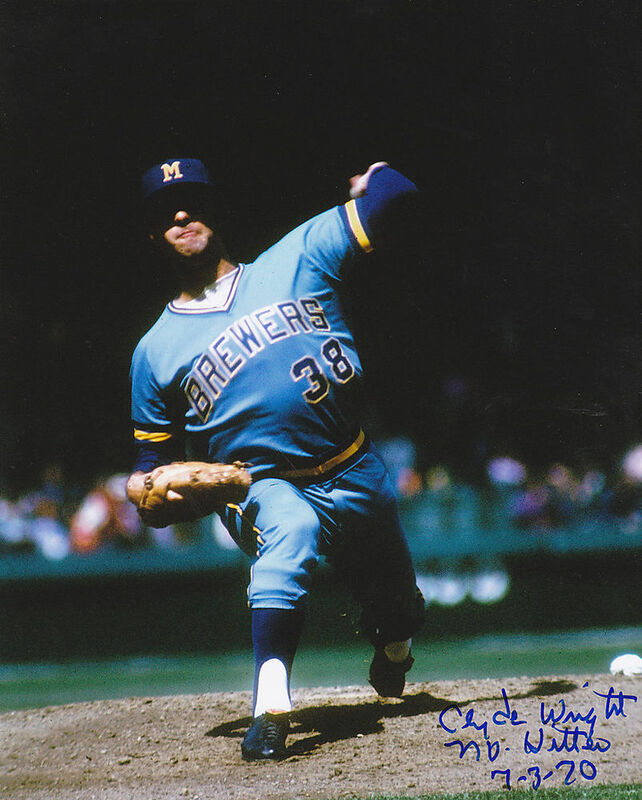 Since a 20-game loser seems to be a thing of the past, it’s entirely possible that Clyde Wright’s Brewers franchise mark will never be equaled or surpassed.